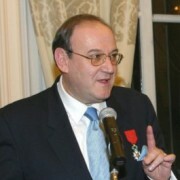 Theodossis Georgiou is the Chairman of the Greek Association for Atlantic and European Cooperation. He is a honorary Lawyer after 40 years of practice at his own firm. Furthermore, he is President of the Eurodefense – Greece, and Member of the Governing Council of AWEPA (The Netherlands), contact person in Greece. Additionally, he is a Member of the Board of Regents of the Fund for American Studies (Washington D.C.) and Co-Chairman of the International Institute for Political and Economic Studies (IIPES, 1996-2012). From 2003 till 2012 he has served as a member of Board of the International Foundation for Election Systems, (UK Limited) Washington D.C.; London. He has been a Visiting Lecturer in various Academic Institutions and Universities in Europe, Caucasus, Canada, the US and Africa and still continues his activities. His academic and research interests focus, primarily, from the political point of view, on transatlantic security and cooperation, Euro – Atlantic integration, role of NGOs in 21st century, as well as North-South dialogue and resolution of conflicts. For the last 25 years Mr. Georgiou has organized and chaired hundreds of symposiums, conferences and round table discussions in Greece and around the Globe and he has delivered wide number of speeches on the issues of his interests. Additionally he has led and participated in countless international meetings, representing Governmental and Non – Governmental sectors. Having a strong involvement in the field of interdisciplinary education, in 2012, Mr. Georgiou, together with other distinguished personalities, founded The International Center for Leading Studies (TICLS), a new educational platform compounding various educational programs. On June 4, 2003 he received the “Chevalier dans l’ Ordre de la Legion D’ Honneur” by the President of France, Jacques Chirac and on November 26, 2004 he received the “Golden Laurel Branch Award” of the Ministry of Foreign Affairs of Bulgaria. He also has several other decorations and distinctions in recognition of supporting the integration of South-Eastern European countries to NATO and EU.